So great and clean hostel!! The bar is too funny and rooms are so cute!!! Very good place to enjoy and visit the city! An hostel that look like a three star hotel, but with plus friendly and young atmosphere, good quality breakfast [not included in the price] and free coffee and tea for anyone. The rooms, toilets and shower rooms are very clean, and the interior design is like an "instagram" picture. Not far from the station and the Dom, a quarter hour of walk, and in a really lively quartier, maybe just a little bit noisy. The staff is really helpful and friendly. I would definetely recommend. Camera spaziosa, curata e molto carina. Pulizia impeccabile. Personale molto gentile e disponibile. Good hostel, beds were so large and comfortable! Probably not great if you are alone for the lack of socialising facilities, but it was OK. Decent breakfast as well. By far the most luxurious hostel I have visited in my life. Huge beds and excellent facilities, as well as very good security. Location is not right in the city centre, but major attractions can be reached in 20 mins walk. The bar at the bottom of the building is an addition to the hostel as it gets quite crowded at weekends offering opportunities to mix with locals. 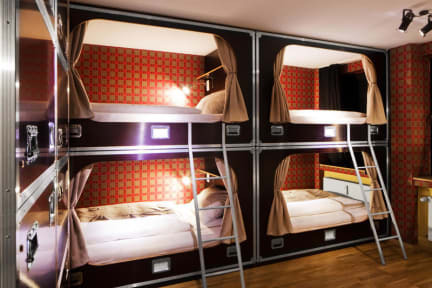 The price is a bit above the average of hostels mirroring the quality you get: this is more a hybrid between hostel and a hotel.